How much am I charged for printing? Copies made with student IDs are charged to students’ personal accounts. Once the subsidy is depleted, students will incur a charge each month for the output created that month. Undergraduate balances are set to the new subsidy at the beginning of each term. Unused subsidies DO NOT carry over from term to term. If you think you may have been over-charged for printing, state the month(s) in which you believe they were over-charged in the body of the email. Departmental PIN copies are charged to the department. Copies made with faculty/staff University IDs are charged to the employee’s department. What types of technology does the library have for check-out? How do I submit my honors thesis to the library? How do I get materials (books, articles, etc.) that W&L does not own? You can request materials from Interlibrary Loan This service is free to current students, faculty, and staff. Requests for recreational reading and textbooks are not permitted. Requests for items in our collection are not processed unless they are checked out or missing. Check the Library System to determine if we own the material you need. If the library has electronic access to a journal article you seek, you will be notified by our ILL staff. Always check our Journal List first to determine if we own the title you need. How do I renew my library material? All Books are subject to recall two weeks after date of check-out. Library patrons may renew checked out materials online or by calling 540.458.8643. Items may not be renewed if they have been requested by another person. Books may be renewed three times. Videos & DVDs may be renewed twice. Music CDs may be renewed three times. More information about borrowing library materials. Technology items (laptops, projectors, camcorders, etc.) may not be renewed. Can the library help me with scanning? Information on using the photocopy machines. Are there any student jobs at the University Library? The University Library employs both work-study and payroll students. Work-study students are placed in the library by Financial Aid. Please inquire with their office for more information. Payroll students are hired by the library as needed. When payroll jobs are available they may be advertised in Campus Notices. The books in our library collections are shelved in “call number” order using the Library of Congress (LC) classification system. Materials in the U.S. Government Documents Depository collection on Level 2 are shelved by the Superintendent of Documents (SuDoc) classification system. LOWER LEVEL 1: bound volumes of journals and magazines (arranged alphabetically by title) also VHS tapes (arranged by call number). W&L Undergraduate Students: Three month loan period. W&L Law Students: Three month loan period. W&L Faculty & Staff: Year from date of check-out. VMI & SVU Faculty & Staff: Must complete a registration form at Leyburn Library Information Desk. Year from date of check-out. DSLCC, VMI, SVU, Mary Baldwin, & Local Middle & High School Students: Must complete a registration form at Leyburn Library Information Desk. Four week loan period. Area Residents (Lexington, Buena Vista and Rockbridge County): Must complete a registration form at Leyburn Library Information Desk. Four week loan period. Friends of the Library Members: Three month loan period. Videos and DVDs are checked out for three days. Not all patron types may check-out this type of material. Local Residents may have up to 3 videos/DVDs checked-out at any one time. CDs are checked out for seven days. Reserve Items circulate for 2, 4, or 24 hours according to the specifications of the faculty member who has placed them in this collection. W&L Faculty, Staff, and Students may check out bound periodicals and reference items for 24 hours. No Renewals allowed. Items from Special Collections, microfilm, and newspapers may not leave the University Library. Contact Special Collections with questions at 540.458.8663. Items may be renewed online or by calling 540.458.8643. Items may not be renewed if they have been requested by another person. Books are subject to recall two weeks after date of check-out. Books, Audio Books, and music CDs may be renewed three times. No renewals for non-circulating items. Non circulating items will incure fines for late returns and if lost be billed at a cost of $1000.00 each. Long overdue items will be billed. The bill will reflect the replacement cost and there may be also be a billing fee of $5.00 per item. The billing fee must be paid even if the item is returned. W&L Undergraduate students with fines totaling $50.00 or more may be blocked from registering for classes or from obtaining transcripts until the fines have been paid. Patrons with fines in excess of $50 may be prevented from checking out library materials until their fines are paid in full. Food For Fines: Undergraduate students may pay their overdue fines with canned goods. The items will be donated to W&L’s Campus Kitchens project. This arrangement applies only to current W&L students. Lost library materials must be paid for with cash, check, debit, or charge. Payment may be made by cash, check (made out to Washington and Lee University), General Debit/Charge (this option for current students only). To recall checked out items, search for the title in our library system then log-in to your library account and click on the link labeled “Request”. You will be notified via email when the item is ready for check-out. All library materials are subject to recall two weeks after check out. If you need assistance locating an item in our collection please ask a library staff member for help or use the form below to email us so that we may search for the missing material. View your library account to see a list of materials you have checked-out and/or renew them. Contact the Information Desk 540.458.8643 if you have further questions. Macs and PCs for student/faculty use are avaiable in the Inovation Lab. Several computers have attached scanners. PCs have Adobe CS, statistical software, Microsoft Office, etc. and dual monitors. The Macs have iMovie, Adobe CS, Microsoft Office, etc. Computers are available for guest access near the Information Desk. No username or password needed. A student Mac computing lab is located on Lower Level 1. Each computer has dual monitors. An student PC lab is located room 301. Each computer has dual monitors. The Leyburn Library has laptops that can be borrowed for 8 hours at a time. Inquire at the Information Desk in Leyburn. The locked study rooms in Leyburn Library are wired for access to the campus network, and other study rooms on those floors are similarly wired. Additional computing labs are available on campus. Call 540.458.4357 or email helpdesk@wlu.edu for more information. Wireless access is available in both Leyburn and Telford Science Libraries, although some areas have better access than others. W&L Students: Swipe your ID card or use the last 7 digits of your student ID as your Access Code. Your account will be charged for photocopies, no charge for scans. W&L Departments: use assigned Access Code. Contact Copying Services @ 540.458.8448 to set-up code. All Others: request Access Code @ the Information Desk. Black & White ($0.10 per page) / Color ($0.50 per page) / Pay @ the Information Desk. Copies made with student IDs are charged to students’ personal accounts. Once the subsidy is depleted, students will incur a charge each month for the output created that month. Undergraduate balances are set to the new subsidy at the beginning of each term. Unused subsidies DO NOT carry over from term to term. To check your printing balance email: helpdesk@wlu.edu If you think you may have been over-charged for printing, state the month(s) in which you believe you were over-charged in the body of the email. 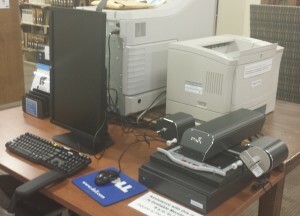 There are two microfilm machines located on the main floor of Leyburn Library. They may be used by W&L faculty, staff, students, and visitors. 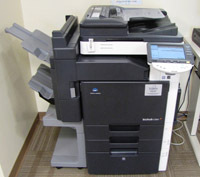 One machine (Minolta MS 6000) prints black & white ($0.10 per page). Pay for the print-outs at the Information Desk. One machine (ST View Scan III) creates PDFs, JPEGs, and TIFFs. Files may be saved to W&L network, cloud storage, or USB. For assistance inquire at the Information Desk. Leyburn, M47 has auxiliary hookups for a VCR (or any video device). To request a VCR for M47 helpdesk@wlu.edu or call 540.458.4357. A multi-region DVD player is available in the Video Editing Suite (M39). There is no fax machine in the library for public use. Inquire at the helpdesk@wlu.edu to get help with sending or receiving faxes through RightFax. Printing: Computers for guest use located near the Information Desk in the Leyburn Library. Printing costs $0.10 a page (black and white only). Guest computers are located on each floor of both Leyburn Library and Telford Science Library. They are available for public use. No login required. Students may not leave belongings in any area (other than their assigned carrel or locked study) for more than 24 hours. Unattended items will be moved to the Library’s Lost & Found. For personal use, we offer carrels, locked studies, and lockers. In order to prevent theft, items of value should not be left unattended in either Library or in your library carrel. MAIN FLOOR: The front part of this floor, toward Washington Hall, is intended for collaboration; individuals looking for quiet study should use the back of the floor (towards Woods Creek) or the lower levels. 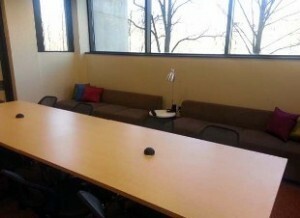 Group study rooms (M40, M41, M42) on the main floor may be reserved. THIRD FLOOR: Room 321 has been designated for quiet study, contemplation, reading, or other quiet occupations. NO computers or phones allowed in this room unless they are turned off while using this space. MP3 players allowed with earbuds. FOURTH FLOOR: There is a reservable study spaced called the Student Lounge (room 422). OTHER LOCATIONS: There are several individual and group study rooms on levels 2 through 4 that are available for transient use. FOURTH FLOOR: There are reservable group study areas located on this floor. Selected films have been purchased by the University Library with Public Performance Rights (PPR) licenses. Search ALL FILMS with Public Performance Rights in W&L University Library’s Collection. A Public Performance is any performance of a videocassette, DVD, videodisc or film which occurs outside of the home, or at any place where people are gathered who are not family members, such as in a school or library. In most cases titles sold by video and retail outlets are restricted to home use only and do not include public performance rights. In most cases, admissions should not be charged. If the film you wish to show, as part of a public performance, is not included in this list, please contact Swank Motion Pictures to purchase the PPR or contact the University Library. For more info on PPR from the W&L Office of General Counsel, read Washington and Lee University Policy for the Use of Copyrighted Works. Please contact Elizabeth Teaff if you have additional questions. Limited to the films the University Library owns by Wu Wenguang and Caochangdi Studio. Public Performance Rights (rights which allow screenings of DVDs for educational purposes) are included when you purchase a DVD at the price applicable to your institution. These permit screening in a classroom or library or to a public group of less than 100 people when no admission is charged. If admission is charged or if the group is more than 100 people, please contact rightsholder for open showing fees. Open Showings are public screenings for an audience, with or without admission. Discounts are available for multiple bookings. Most products include “life of tape” audiovisual, school district circulation and public performance rights. Other rights that may be included or available at additional cost are: unlimited circulation, close-circuit, broadcast/cablecast and digital/video-on-demand and will be noted on the product description page if included in the purchase price. From the Icarus Films website: “DVDs purchased from Icarus Films are licensed with Public Performance Rights for non-commercial and educational exhibition when no admission fee is charged. DVDs are “Leased for the life of the media.” NOTE: Films from First Run/Icarus Films include PPR while films from First Run do not. All products purchased from Kultur directly include public performance rights provided they are played on a single monitor at a single location, and that there is no admission charged. Programs on Kultur DVDs cannot be transmitted over any closed circuit television system, nor sent via any system to distant learning locations. Faculty and staff at Washington & Lee University are allowed to watch the DVD, The Southern Cross: The Story of the Confederacy’s First Battle Flag, ingroups, so long as admission is not charged. The following databases are available to alumni: Academic Search Complete Alumni Edition, Business Source Complete Alumni Edition, JSTOR Alumni database, and Project Muse. NOTE: Alumni need to have a Colonnade Connections login and password set up. Information about depositing Honors Thesis in the University Library. Leyburn Library has approximately 90 easels available for 24 hour checkout. To reserve them, email Elizabeth Anne Teaff at the University Library. Leyburn Library: Items found in Leyburn are held at the Information Desk on the main floor. Items of value (laptops, backpacks,etc.) left unattended may be picked up by library staff and brought to the Information Desk for safe-keeping. Please contact the Information Desk 540.458.8643 if you have lost something in Leyburn. Telford Science Library: Items found in Telford are held at the Circulation Desk on the 3rd floor the Science Library. Items of value (laptops, backpacks, etc.) left unattended may be picked up by library staff and brought to the Circulation Desk for safe-keeping. Please contact the Circulation Desk 540.458.8111 if you have lost something in the library. NOTE: Lost and found items from Leyburn and Telford Libraries will be emptied/donated on the 1st of every month. Stop by the Information/Circulation Desk in either library to check for your lost items before they are removed.